Bat Houses: Once you have gone to all the effort to exclude unwanted bats from your property (or you would simply like to provide a roosting opportunity for the bats in your neighborhood), why not erect a Bat-House so as to provide a replacement roost for your newly evicted bats! The pragmatic selection of a workable design & placement of these artificial roosts should be done well before the exclusion is performed. We offer the following suggestions that should be applicable to most of South Dakota. 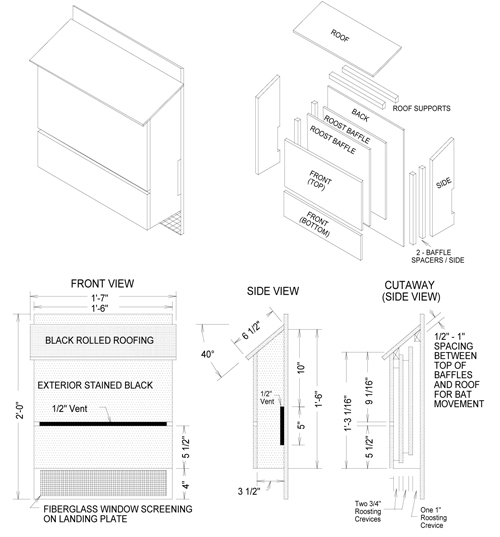 Construction materials: Exterior walls (including backplate) and roofs should be constructed from the thickest material possible to help keep interior temperatures stable and to prevent loss of warmth during evening/overnight hours. Ventilation holes/openings are optional in our region and need not be included. Do not use pressure-treated or chemically-treated wood in constructing your bat house as these can be toxic to bats. Weathered 1"-thick roughcut boards are a good choice. Surface treatment: All exterior surface should be stained or painted dark colors so as to absorb radiant heat from the sun (bats like it hot!). Interior surfaces should not be treated with any paints, stains, or varnishes. Avoid boards that are likely to ooze sap/tar/resin when exposed to the sun. Whistles & bells: Do not use metal screen on the interior surfaces of the house - though it may seem like a good idea, screening material has sharp edges that can damage delicate wing-membranes, toes, feet, and thumbs. Plastic screen is a better choice, but why not simply 'rough up' the interior surfaces slightly so as to give the bats toe-holds. Increasing the size of the 'landing pad' beneath the bat-house will increase the chances that your box will be used by bats. Mounting your bat-house: Your bat-house should be mounted on a vertical surface at least 10-12 feet off of the ground - higher is better. This height will protect your bats from most squirrels, cats, birds, and children with sharp sticks. If your bat-house is mounted on a pole, you might want to ring the pole with metal flashing to prevent cats and squirrels from climbing up into your bat-house. 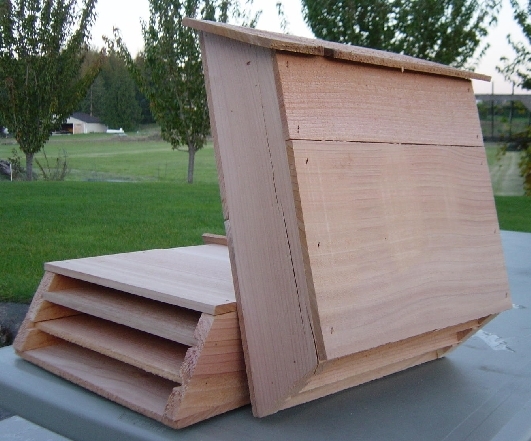 If you mount your bat-house on a tree, insure that there is open space below the box so that bats can come and go freely without having to fly around branches and foliage. Regardless of the location, be sure to mount the bat-house where it will receive as much sunlight as possible. Location, location, location: If you must choose between a site closer/farther to water (stream, river, pond) - closer is better. Water leads to a greater diversity of vegetation which generally results in more insect prey and that is what your bats will be looking for! Young bats need a lot of open space when they are learning to fly - a nice open backyard is far better than a grove of trees, or among densely packed buildings. Again, be sure to mount the bat-house where it will receive as much sunlight as possible. Be patient: If you don't see bats in your house immediately, don't give up! Leave the house in place! Bat's are picky and quite suspicious of new things - it may take months (sometimes years) before bats adopt your bat-house as their home. Even if your neighborhood bats do not use your new bat-house as a permanent roost, it may well serve as night roost for short periods of rest-&-relaxation between hunting trips. How will you know that you have new tenants? If you don't see bats flying about your bat-house just after dusk, you might want to look around on the ground directly beneath the house for other types of evidence (guano). 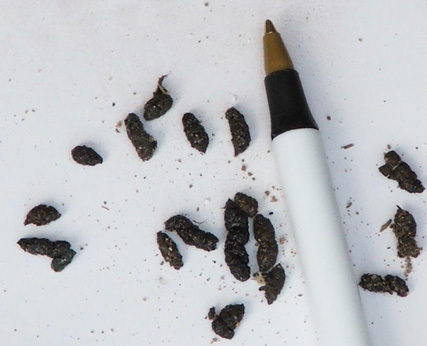 Bat poop is composed mostly of chewed up insect wings, legs, and bodies - if you drag your foot over the pellets and then look at them in bright sunlight, the material should glitter just a little bit as the light shines off of all the bug parts!